Carnosine is a naturally-occurring amino-acid, which has powerful immune boosting and antiaging properties. Although Carnosine has been known about for some time, its popularity as an antiaging supplement is relatively new -sparked by dramatic discoveries about its antioxidant properties. 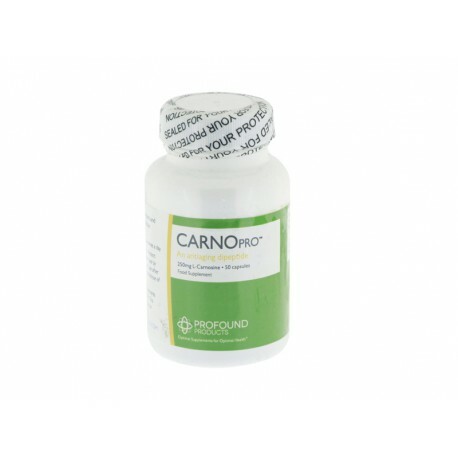 Carnosine supplements offer a host of life enhancing properties and benefits. Carnosine flushes toxins from the body; it reduces and prevents cell damage caused by beta amyloid -the substance found in the brains of patients with Alzheimer’s disease; and it has potent immune boosting properties. Carnosine eye drops, containing another form of Carnosine known as N-alpha acetylcarnosine (NAC) under the brand name Can-C – have also been used to help eradicate senile cataract problems with great success. It is believed that Can C carnosine glaucoma treatments may also benefit people with certain types of glaucoma. Carnosine eye drops may have very important antiaging eye functions too, because they don’t simply inhibit protein cross-links, they actually break them. The recommended Carnosine dosage is between 500mg per day with occasional breaks. We sell 60 x 250mg capsules which is a months supply of Carnosine. Carnosine is a potent antiaging supplement. It is a natural antioxidant and anti-gylcosylation inhibitor, which plays a vital role in fighting against aging, cataracts, diabetes, kidney and skin problems. Future research may also confirm wider benefits, such as carnosine autism treatment and glaucoma remedies using Can-C -adding further weight to Carnosine’s potential. What I like to ask, if the above is true, doesn’t then make sense to take, beside carnosine, also the amino acids, histidine and alanine too? I didn’t see anything mentioned about that. What is your opinion of this? Description: L-Carnosine is a natural anti-oxidant and a potent late-stage anti-glycosylation inhibitor. Directions: Take 1 capsule 2 or 3 times daily. Other ingredients: Rice flour in a vegetable capsule. Note: Keep out of reach of children. Protect from heat, light and moisture. Not for use by pregnant or lactating women. Do not use after the expiration date.